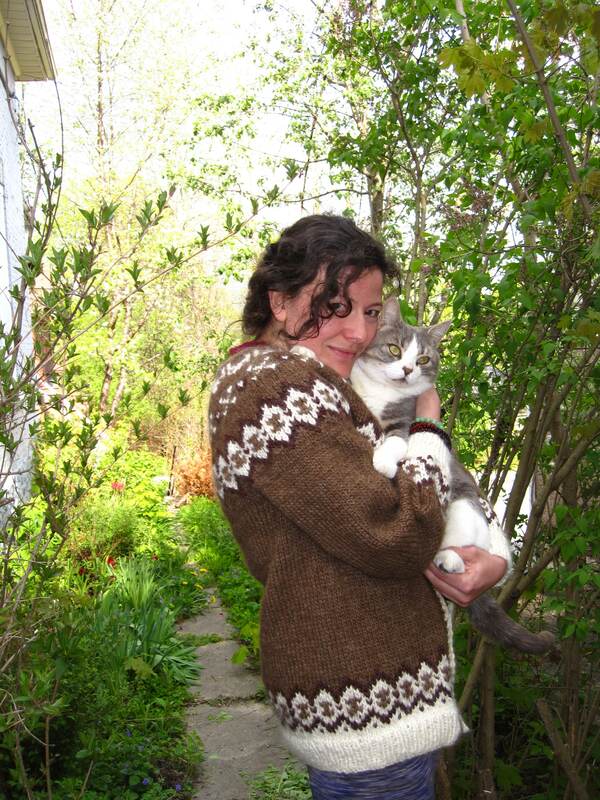 Quite a few years ago, I purchased this Alafoss Lopi knitting pattern for an Icelandic design cardigan. I love how the darker colour outlines the pattern. I couldn’t wait to knit it! 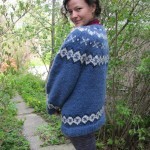 The pattern is knit on circular needle needles, with the sleeves and body joined together in the yoke. I hate sewing seems, so this made finishing much easier. I found a cheaper yarn at the local Eaton’s store in Peterborough Square and decided to do it in blue white and navy. 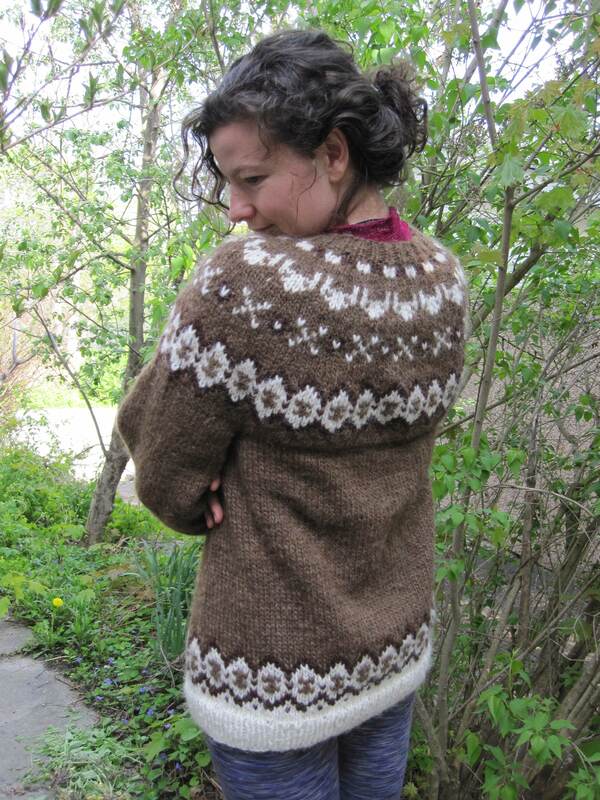 The yarn used in this pattern is just single spun and is not plied. I remember finding that it was very loose and I would often try to twist it tighter while knitting. I know that I knitted it longer than it was supposed to be, thinking that this was a good idea to make it cozier. 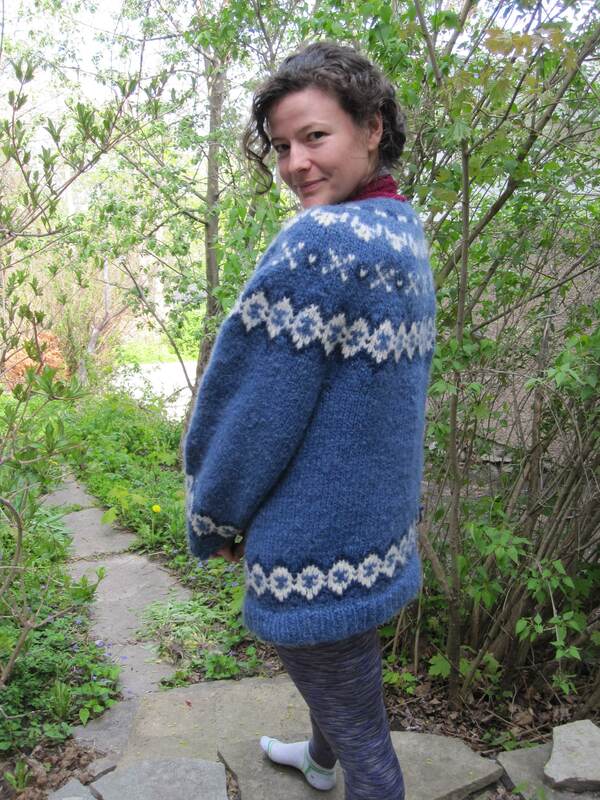 As it turned out, I knit a little too loosely as well, and made the whole sweater a bit too big. My daughters did wear it, but that was when they were wearing everything loose and large. 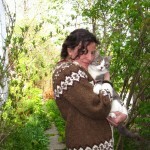 A few years later, I was at an auction of knitting supplies, wool and yarn from a store that had gone out of business. It was a snowy day and we had to drive to Orange Corners for the sale. The place was packed. 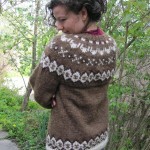 I bought a package of several skeins of the brown Alafoss Lopi wool, as well as needles and other types of yarn. Now I needed the contrast colour and the white yarn. I found the white, but couldn’t find the chocolate brown anywhere. 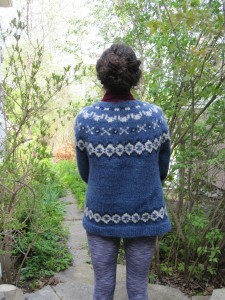 I had to get “Happenstance Books and Yarn” in Lakefield, to order for me. 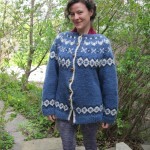 I knit most of the body and the sleeves and then put it aside for some time. I must have needed the circular needle, and replaced it with a smaller one. 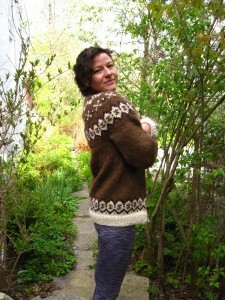 When I picked it up again and started knitting the yoke, I realized my mistake. I wasn’t going to rip it out so I just switched to the proper needles and finished the project. 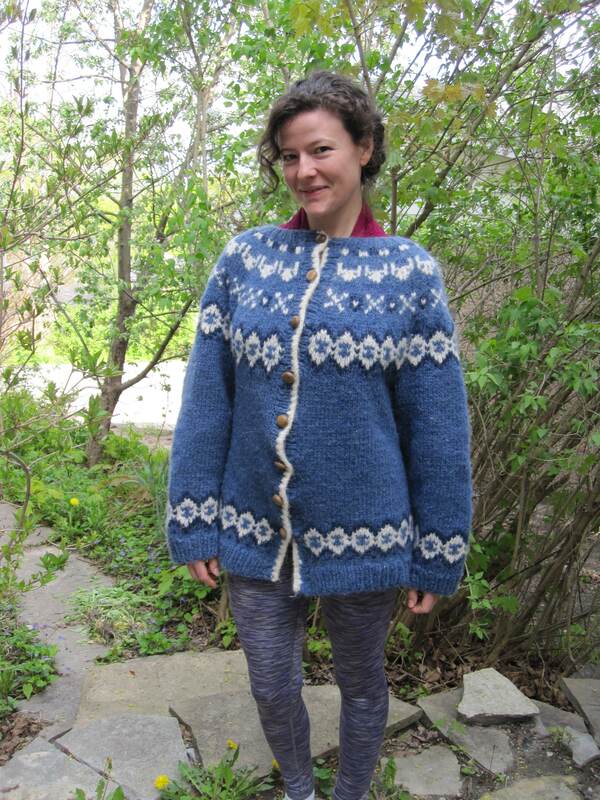 You can see a band around the sweater as a result of this mistake….. a “design element”! 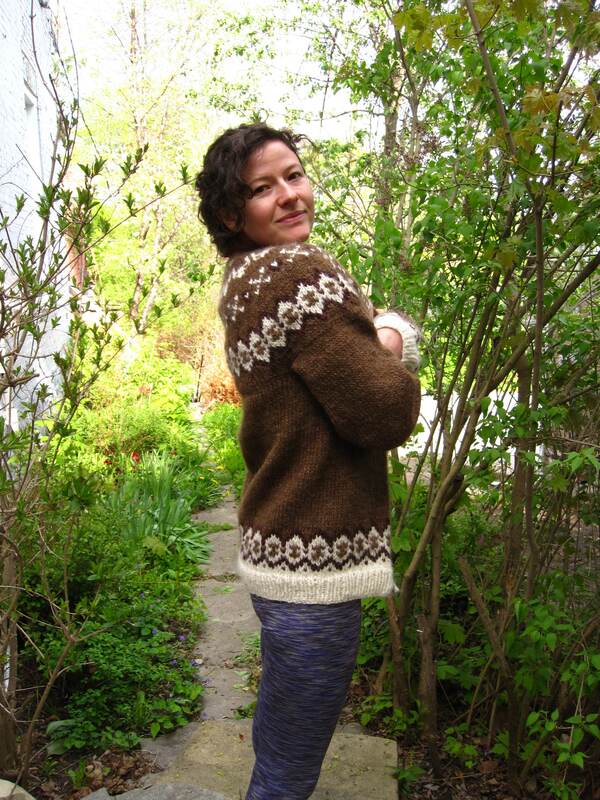 The brown sweater turned out much better than the blue. I am thinking about trying to felt or shrink the blue one to make it fit better. I still haven’t put buttons on the brown one. 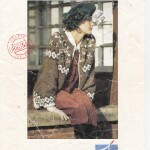 I think you mentioned that you were searching for vintage knitting patterns. I found a few at the antique mart. Where can I mail them?